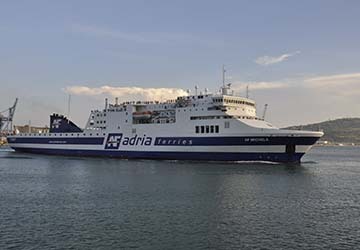 Serving the long-standing maritime link between Italy and Albania, Adria Ferries was established in 2004, and has transported over two and a half million passengers and seven hundred thousand vehicles ever since. By 2014, the company was recognised as a market leader in ferry crossings between the two nations, operating one of the largest fleets in terms of total capacity. Previously named Conero Riviera, AF Michela was the original vessel in the Adria Ferries fleet, holding over eight hundred passengers, while AF Claudia, one of the biggest ferries in the Adriatic Sea, can carry more than fifteen hundred passengers, boasting two hundred and eighty luxurious cabins. AF Francesa joined the fleet in 2009, in accordance to the newly introduced Bari-Durres route, followed by the ships AF Marina in 2012, and Aurelia two years after. View Adria Ferries timetables, prices and book Adria Ferries ferry tickets with directferries.co.uk. Looking for an alternative route or ferry company to fit your plans? Don’t worry, we’ll also compare Adria Ferries with alternative ferry companies in your search to help you choose.